What books are you reading this summer? I have a sky scraper of reading material resting on my bedroom nightstand. All partially read and waiting to reveal their endings. Biographies, books on spirituality, fictional suspense, research findings on courage, and the magical essence of creativity. Lately, I’ve taken to reading on weekends while drinking my morning coffee. This past weekend was rainy and all sorts of cozy, so naturally donuts were in order. 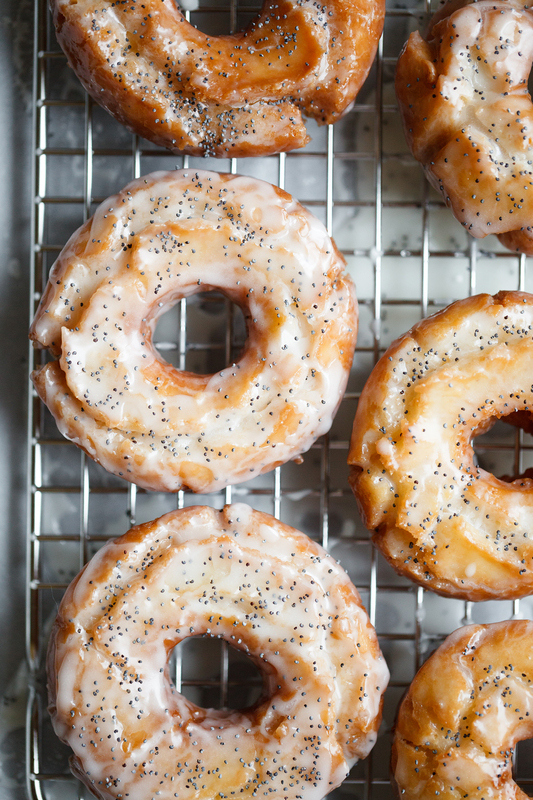 Lemon Poppy Seed Old Fashioned Donuts. While munching on a crispy and tender donut, I read more of Big Magic by Elizabeth Gilbert. She writes on what is means to live creativity beyond fear. A fascinating topic since over the years I’ve discovered fear to be the constant companion to my own creativity. For every new exciting creative venture, there’s the fear of failure and disappointment. This book has me reflecting on what my motives are for creating. To honor the need within us to create. Whether it be with our hands, written or spoken words, ideas, music, dance and so on. It’s always there waiting to be discovered. Gilbert writes about approaching fear with acceptance and love. Not the typical ‘conquer and destroy’ that society teaches us. Her writing is sincere, funny, and insightful. I’ve had countless ‘ah-ha’ moments and the authenticity of her experiences are warmly inspirational. Her thoughts on where creative inspiration comes from are beautifully magical (hence the title). This book is akin to having a conversation with a wise friend. If only I could share a donut with Elizabeth Gilbert. 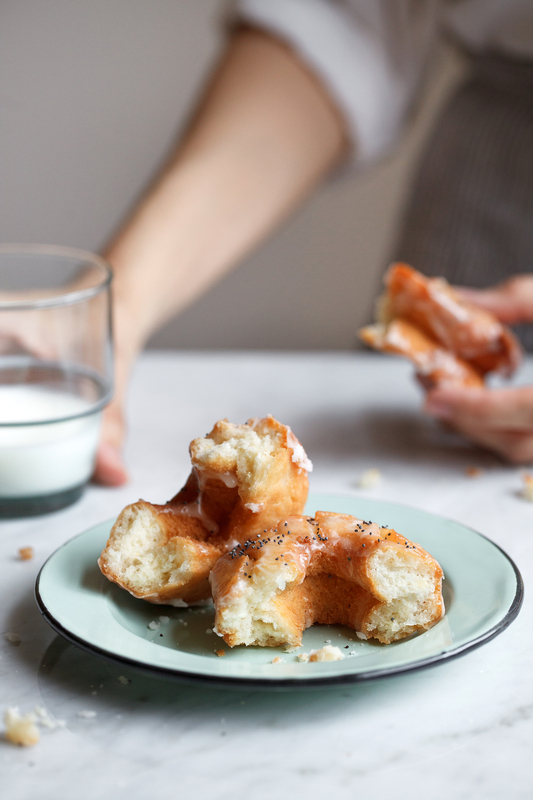 These Lemon Poppy Seed Old Fashioned Donuts had their own magical outcome when I discovered that they tasted even better on the second day. Old fashioned donuts get their signature cracked petal shape by being fried twice on both sides. Their ridges are filled with a tangy and fragile glaze that seeps into the donut and seals in the moisture. The dough is very simple to make. It can be made a day in advance and left in the refrigerator overnight. Fry the donuts off in the morning and eat them fresh or fry them the evening before and eat them first thing the next morning. It’s a win-win. In a small bowl, sift together flour, baking powder, salt, and nutmeg. In a stand mixer, with the paddle attachment, add sugar and lemon zest. Rub together briefly with your fingertips to release the zest oils into the sugar. Add soft butter and mix for 1 minute, on low speed, until sandy. 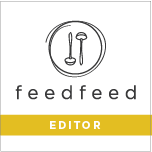 Add egg yolks and mix for 1 minute, on medium speed, until combined. Scrape down bowl as needed. Add dry flour mixture to wet egg mixture in three separate additions, alternating with the sour cream (start and end with the dry ingredients). Mix each addition, on low speed, just until combined. Transfer the sticky dough to a clean bowl and cover with plastic wrap. Chill in the refrigerator for at least 2 hours or overnight. Set the temperature of a deep fryer to 325F (165C) or fit a large pot with a candy thermometer and oil (at least 2-inch deep). Line a large baking sheet with parchment paper and set a wire cooling wrack onto the baking sheet. Prepare lemon poppy seed glaze and set aside until ready to use. On a well floured work surface, roll out the chilled dough to 1/2-inch thickness. Cut out rounds and each of their centers (3 1/4-inch round cutter and 1 1/8-inch round cutter). Dip cutters into flour between each cut. Gently re-roll dough scraps and repeat. Shake off excess flour from rounds and place on a parchment lined baking sheet. Transfer to the refrigerator and keep cool until the fryer is at the proper temperature. Carefully add two dough rounds to the hot oil. Once the donuts float, about 10-15 seconds, gently flip them over. Fry for 2 minutes, until cracked and lightly golden, then flip over and fry the other side for 2 minutes. Again, flip over and fry for 1 minute. Flip once more and fry for another 1 minute. Transfer to the prepared cooling wrack. 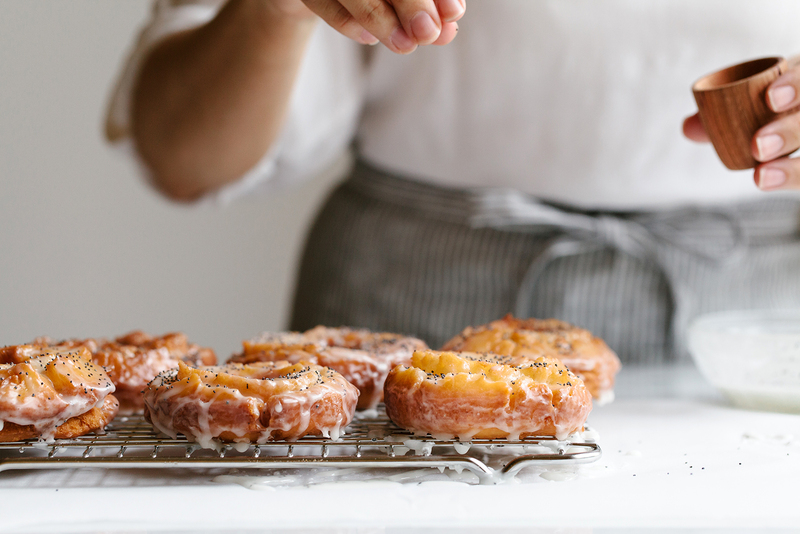 Immediately, coat each donut with glaze, flip over and glaze each of their tops. Sprinkle generously with poppy seeds. Repeat frying (allowing oil to reheat to 325F between each addition) and glazing process until all donuts are coated. 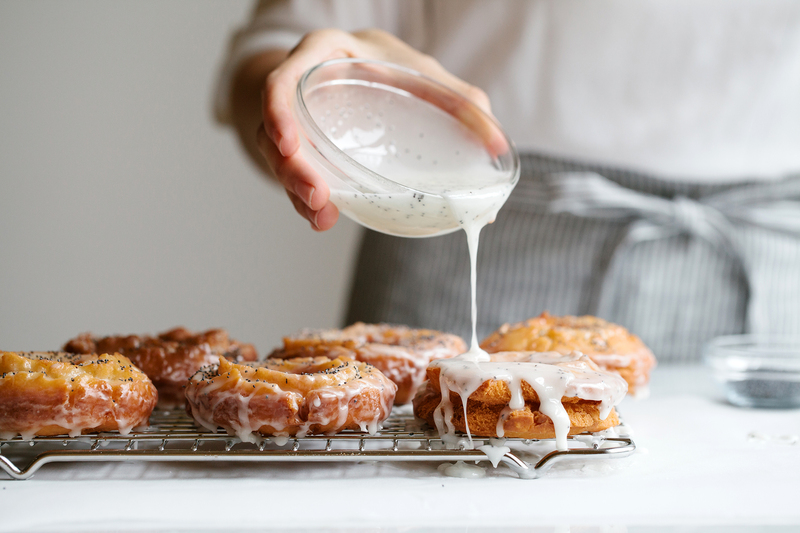 Scrape up the glaze drippings that fall onto the parchment paper and reuse to finish coating donuts if needed. Serve donuts warm or allow them to cool, store, and enjoy the next day. Store leftover donuts, in an airtight container, at room temperature. Donuts taste even better the following day as the glaze seeps into the donuts and seals in moisture. In a bowl, whisk together powdered sugar, light corn syrup, salt, vanilla, and lemon juice until smooth. Any leftover glaze may be stored in an airtight container for up to 1 week. i can never seem to just leave a book midway through; if i love it, i finish it in one sitting (therefore screwing up the rest of my day/sleeping schedule/etc). if i don’t, i don’t finish it or i end up confused and lost when i try to pick it back up much later. Hi Heather! I’m the same way when it comes to fiction. If it’s good, I’ll disappear for days until it’s done. Non-fiction books like ‘Big Magic’ are full of thought provoking ideas. I have to take a break to mentally processes everything and let it all sink in before I take another big gulp. Let me know if you have any book recommendations! I’m always up to adding more to my nightstand pile. Be still my heart! 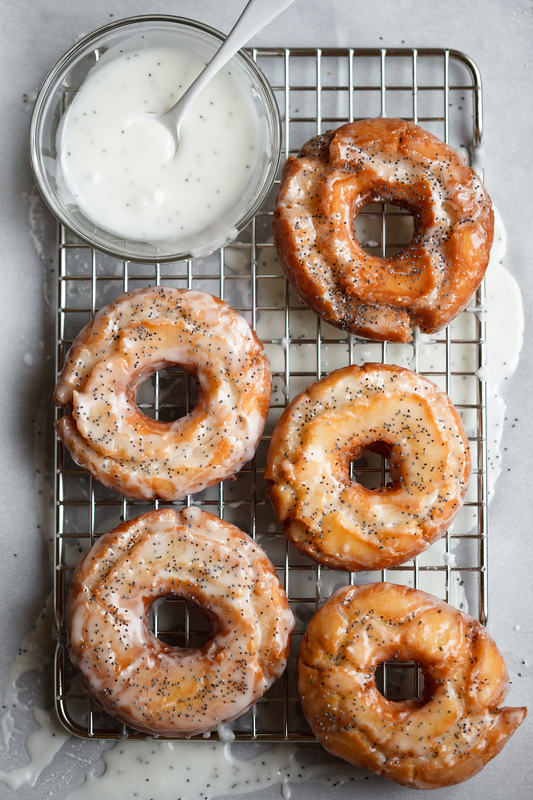 These donuts are gorgeous… major heart eyes over that glaze :). As for what I’m reading, I must admit that while I love to read, I’m not reading anything at the moment. However, one of my favorite books ever that I read almost every year is The Great Gatsby. Thank you, Laura! I love the classics. The Great Gatbsy is a great one to read again and again. Those books never get old. My favourite. The photo of the half eaten doughnut. TRUTH! Shantaram by Gregory David Roberts. A heck of a ride for the soul and the mind! Thank you for the recommendation, Anthony! I’ll have to check it out. Loved this recipe and so did my coworkers! It was surprisingly easy to manage despite using a makeshift rolling pin (vodka bottle), donut cutter (wine glass), and deep fryer (big pot of oil). I saw a similar recipe for plain old-fashioned donuts and your’s seemed to address all the concerns people left in the plain’s comments. Some donuts did taste a little like old frying oil, but that may be because I doubled the recipe; lost track of time on a few; and let the oil get a little too hot on some. I’ll be trying this again with smaller donuts and may decrease the frying time a little to accommodate. Thank you, Patti! I’m happy to hear that the donuts were an overall success and that every one enjoyed them. Smaller donuts sound like a great idea too. Donuts are always a good idea. Can I just say, I love your Macgyver methods!